Carbon foot printing is nothing but release of greenhouse gases like Carbon dioxide (CO2), Methane (CH4), Nitrous oxide (N2O), Hydro fluorocarbons (HFCs) etc, in to the atmosphere directly or indirectly by a person, group, event, organization or product. As an individual, we should try to put in some effort to minimize the emission of green house gases (GHG’s) into the surrounding environment and we must also educate our friends and family about the benefits of lessening GHG’s by adopting very simple alternatives in daily life. GHG’s are also released by activities taking place in organization/events which includes direct and indirect emissions. Direct emissions are from onsite fuel consumption, manufacturing works, company vehicles and transportation, process emissions etc. whereas indirect emissions are caused by unnecessary usage of electricity and heat. Frequent business travels, waste/refuse disposal, paper wastes, water /food waste can also add to it. Product carbon footprint is caused by emission of GHG’s at every stage of product’s life starting from extraction, production and transportation of raw materials to waste disposal. The following is a list of items that may take an initial investment, but should pay for themselves over the course of 1-4 years through savings on your energy bills. Travel less and travel more carbon footprint friendly. · Next time you replace your car – check out diesel engines. With one of these you can even make your own Biodiesel fuel. Find out more about Biodiesel. As well as your primary carbon footprint, there is also a secondary footprint that you cause through your buying habits. There are so many useful websites to browse up on. Some are listed here. 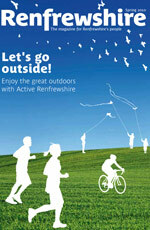 Spring 2010 from Renfrewshire Arts &Museums ! Spring 2010 is an exciting season of performances,exhibitions and loads of events.Something can be found for each and everyone like drama,dance,music and entertainment,comedy,exhibitions, talks and community events.There are several activities and programmes for children which will keep them entertained.For further information and to book a place please visit www. Renfrewshire. gov.. uk/events & www.scottishtheatres.com. Contact : ram.els@renfrewshire.gov.uk / phone : 01418871010 if you would like to be added for customer information list or have any comments. Robert Tannahill ‘s Bicentenary on May 17th ,2010. 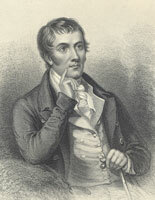 Robert Tannahill was a famous Scottish poet born to weavers family. He was born at castle street in paisley on June 3rd,1774. Some of Robert Tannahill’s best work was inspired by his walks around Paisley in the Gleniffer Braes, Stanely and Ferguslie.His famous work includes “Thou Bonnie Wood o’ Craigie-lea” and “The Braes o’ Gleniffer”. Robert Tannahil breathed his last on 17th may 1810 ,in a culvert at the Candren Burn in Paisley, in the early hours of the morning. On May 17th, 2010,Tannahill’s 200th Anniversary is being held,which is followed by series of events like…. Go! Renfrewshire 2010 is a two-week festival to rejoice and enjoy great outdoors and fresh air of Renfrewshire which is running from 22nd May to 6th June, 2010. It’s a great way to explore beautiful countryside, join in for various kinds of walks, cycle rides, horse rides, rowing, kayaking, jogging, picnics, and treasure hunts and can even try tai chi using Scottish outdoor access code. The good news is most of the events are free and there is something for everyone. Full details and programme listings can be found on pdf document in the link provided below.